UcamX captures not just layout data but also netlist information, customer specifications, mechanical drawings and manufacturing rules in a single smart engineering database. From the database launch automatic DRC and DFM checks without vendor limitations. Optimize plant yields using automated DFM routines. UcamX deploys powerful automatic security tools to detect accidental operator errors. For flexible circuitry see our Ucam uFlex brochure. At the heart of UcamX are its newly designed 64 bit core engine and a smart new feature called Parallel Processing (PP). They are the key to the software’s astonishing performance. The 64 bit UCAMX core addresses more computer memory and allows high layer count jobs or massive data volumes to process without a hitch. In the Parallel Processing concept, highly efficient new algorithms split up CPU-intensive CAM tasks between various CPUs of a multicore workstation and complete within a fraction of the time standard CAM software packages would need. The more CPUs on the workstation, the faster the software. UcamX Hypertool scripting delivers in-depth custom automation without limits. 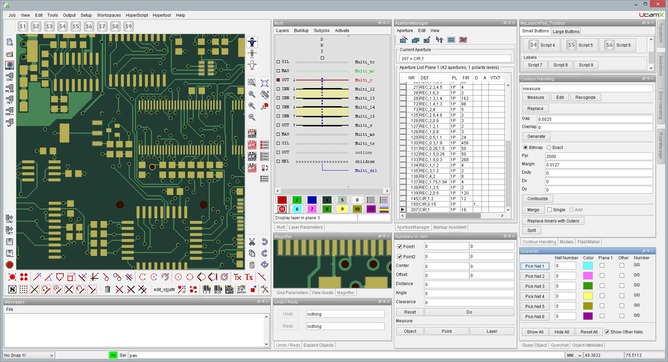 Unlike batch-sequencers, HyperTools give you access to full core CAM functionality. Simplify and accelerate your process automation. Write new CAM routines to automate your new technologies or to integrate CAM deeply into your business systems. The Java™ carrier means that HyperTools are structured, robust and reliable, fully integrated into the UcamX GUI. UcamX is delivered ready-automated with built-in dynamic functionality for a fast roll-out and a fully customized smart workflow. Labor-saving functions include automated board structuring, netlist and test-point generation without manual intervention, & dynamic yield-driven auto-panelization. Working on one job and need to look at others? No need to close down: just use Load Balanced Sessions to open as many extra jobs as you need on your workstation. UcamX Visual HyperScript (VHS) scripting delivers operator level automation without limits. Record repetitive tasks or write new CAM routines to automate your CAM flow or to integrate CAM deeply into your business systems. The VHS function library contains more than 1000 commands. 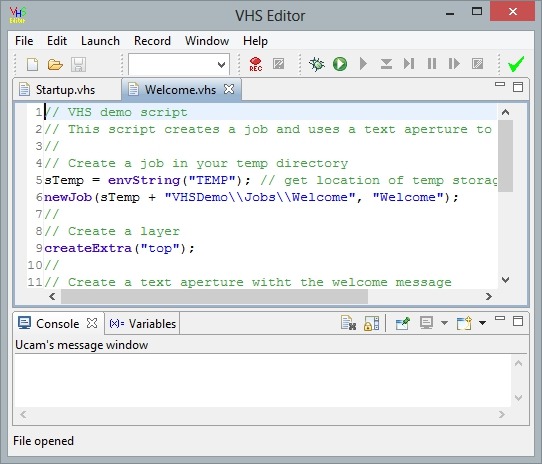 The VHS Editor (see picture) offers a complete programming and debugging environment to test created or recorded scripts. Scripts can be attached to custom toolbars and launch pads. 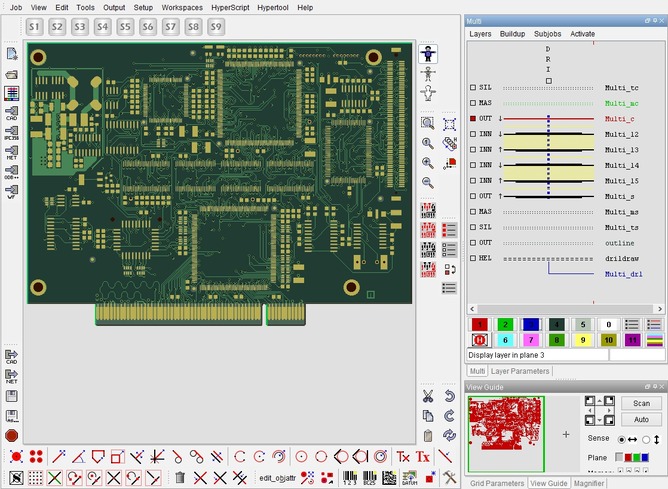 UcamX is Ucamco’s latest generation of CAM software for the Rigid, Flex and HDI PCB manufacturing industries. It takes advantage of modern day multicore and 64 bit workstation technology to set new standards in performance and throughput, and comes with a clever and highly intuitive new user interface that adapts itself functionality-wise as a job progresses through the CAM workflow. UcamX’ most eye-catching novelty is undoubtedly its new graphical user interface. It excels at comfort, ease-of-use and convenience and abounds with sparkling widgets and surprising can dos… We call it Workspace GUI. It lets you layout, store and reload different configurations of dialogues and toolbars, depending on which stage of the CAM process a job has reached. As it enters the next stage, just call up the workspace to go with it and Workspace GUI does the rest: it re-arranges itself to bring the required functionality within easy reach. : it re-arranges itself to bring all required functionality for the task at hand within easy reach: multiple rows of toolbars – side by side or stacked on top of each other, HYPERTOOL or VISUAL HYPERSCRIPT programs directly accessible from a toolbar icon, a slick “pin bar” where dialogues slide in to and out of, it is all there for you to discover and make the interaction with the program a real joy… UcamX comes with a set of pre-defined workspaces right out of the box so you can hit the ground running. And should something not be entirely the way your CAM department is used to going about things, all it takes is a couple of drag’n’drops to adapt an existing workspace to your exact needs or to create an entirely new one.